As previously reported, in 2008, a new Chanel department opened on the beauty floor of Saks Fifth Avenue's flagship store. This boutique-within-a-store covers 850 square feet of space, and it features separate counters for cosmetics, skincare, and fragrance. The fragrance area offers every available Chanel scent in every available formulation, including the limited-distribution Les Exclusifs de Chanel line and special larger sizes of the classic No. 5 (900 ml!). Chanel's presentation of its fragrances at Saks is innovative and interactive: customers are invited to sit on chairs upholstered in Chanel tweed, facing a specially trained consultant over the "Olfactive Bar". There, it is possible to inhale Chanel's fragrances one by one, not on mere paper blotters, but on slender, white ceramic wands that have been saturated with scent. 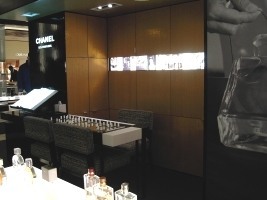 The walls of this fragrance niche are decorated with iconic Chanel motifs, as well as photographs of Coco Chanel herself. To one side, an illuminated "book" recounts the history of Chanel fragrance, with "pages" that are "turned" by the viewer's hand under a motion sensor. This experience is a dizzying, but satisfying, immersion course in the evolution of Chanel Parfums. Afterwards, you can also explore the brand's elegantly packaged makeup and skincare in similar depth. Details: 611 Fifth Avenue (at 50th Street), New York, NY 10022, 212-753-4000. Nearby: Sephora (597 5th Ave.), Juicy Couture (650 5th Ave.), Takashimaya (693 5th Ave.), Henri Bendel (712 5th Ave.), Molton Brown (515 Madison Ave. at 53rd St.), as well as numerous name-brand clothing stores. — image and report filed by Jessica M.